Jesse Thompson of Kaplan Thomas Architects and the Portland Housing Authority's Jay Waterman on top of ultra-efficient Bayside Anchor apartments. Until recently, “passive housing” — residences built to achieve ultra-low energy use — has been kind of a boutique-y effort, with eco-minded homeowners making upfront investments to radically reduce their carbon footprint. But now, Maine is on the leading edge of a surge in its development, on a large scale. Last fall, the nation’s biggest passive housing complex opened in Brewer. The 48-unit Village Center, as it’s called, meets strict energy efficiency standards set by a national institute. It’s one of just 36 such buildings in the country. 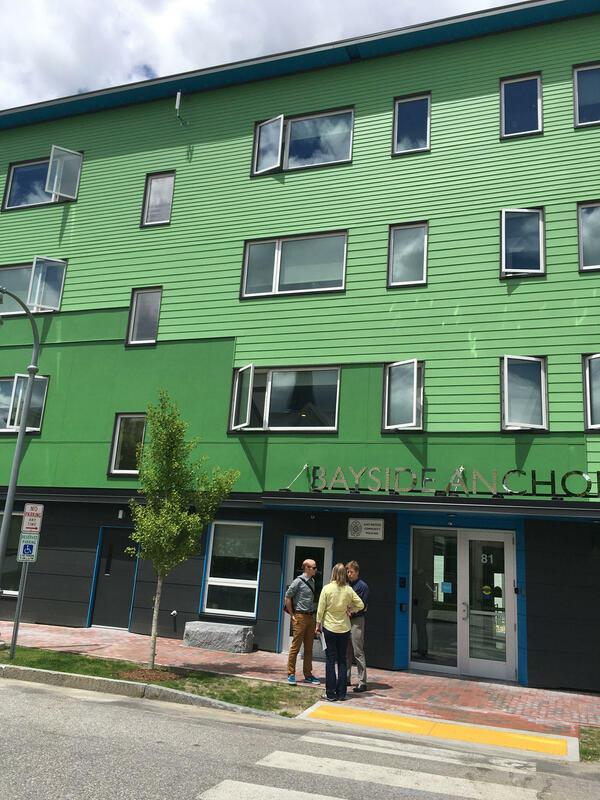 And now, the Bayside Anchor — a big, green, somewhat boxy looking four-story building near Portland’s Franklin Street artery — has joined the group. “Brand new from the ground up. This was a parking lot,” says Jesse Thompson, the building’s architect. Thompson says the 45-unit project had to meet a lot of goals: construction had to be cost-effective enough to qualify for affordable housing tax credits and financing through the Maine State Housing Authority and the project's co-developers — the city public housing authority and affordable housing group Avesta Housing. “I know it had great insulation. I had to shut off my heat in February — it was too hot,” he says. Thompson says the building does have incredible insulation, including walls that are several inches thicker than basic code would require. “It’s cellulose insulation: its recycled newsprint. It’s 10 inches thick, you know, really well done. And there’s triple-glazed windows. So you can sit next to the window in the middle of winter in a T-shirt and you won’t be cold. And that allows us to really radically downsize the heating system,” he says. In fact, there isn’t a central heating system. Instead, each apartment has a small electric baseboard heater, with an estimated annual electricity cost of just $125. “So all the bad air, all the bad smells go out. But the heat stays in. Buildings like this actually have a lot of air movement through them because people need fresh air. And so really good heat recovery on the machinery can do amazing things. The fancy name is a ‘heat recovery ventilator.’ But they feel like magic to us,” Thompson says. In Bayside Anchor's lobby, the concrete floor is the building's foundation. To save money, the developers polished the slab instead of installing flooring above it. The building has other environmentally friendly features: a roof-full of solar panels, a handful of heat exchangers to cool the lobby and, underneath, instead of a basement, big retention tanks that allow rainwater to filter slowly into surrounding land, bypassing the city’s overworked stormwater system. And all of that a cost of about $145 per square foot — low for Portland’s expensive housing market. Thompson says the high-efficiency materials and systems markets are maturing, with prices dropping quickly. And, he says, public housing agencies are beginning to embrace the long-term savings gained through lower energy and maintenance costs. “Everyone is starting to see how the economics are working. And a lot of the state housing agencies are incentivizing it. They are giving extra points for meeting these energy goals. So we’re going to see a big wave coming in the next five years,” he says. Katrin Klingenberg, executive director of the Passive Housing Institute in Chicago, says the wave may have arrived. Last year, the number of applications for certification by her organization doubled, then doubled again this year. And it’s not just because passive buildings can be money-savers. “They are also very comfortable, they are resilient, they can coast through power outages and they are also very good for the planet in terms of limiting carbon emissions during the operation,” she says. And it is good for the housing industry too: Maine-based Wright-Ryan Construction, which was the construction manager on both the Brewer and Portland passive housing projects, just started construction on a lower-grade building at the Waynflete School. This story was originally published June 5, 2017 at 5:13 p.m.